Fourfeit is a word game in which you change one letter of a four letter word to create new words for points. You compete against the CPU or against a friend and try to outscore them by creating more complex words. Fourfeit is for iPhone, iPod touch, and iPad and is by Yellowbek Ltd. This game simple. I spent some time with Fourfeit and tried to analyze it more carefully than just a Scramble spinoff. Too be honest, this app game can burn through quite a bit of time. Say, you’re in the movie theater and you arrived too early… instead of watching commercials, you can play this with your date or friends. Rhyming and sometimes random guessing was the general strategy, though that’s probably because I’m far from an English major. The functionality could use some work since the scrolling through the letters is a bit loose. On the timed modes where you have a limited time to make a word, it can be a tad annoying, but it’s nothing major. As for the graphics, there isn’t much. The Chameleon mascot and scale patterns are a bit out of place, but this game reminds me of an old slot machine game that also acts like a piggy bank for children. It’s kinda ugly, yet it has it’s own charm. As for the gameplay, it works. No real glitches or bugs that I found, but the most fun I had was that the game, based on four letter words, has no parental filter. You can say –any- four letter word, and you can bet, if the opportunity comes up, those special words we all know and love will be used. I got some chuckles when the game’s CPU actually gave me ‘L-A-M-E’ then ‘G-A-M-E’. It’s like it’s trying to tell me something. The fun really comes from racking your brain for a few minutes to see how versatile you’re knowledge of 4-letter words really is… or for everyone else, passing the iPhone or iPod to your friend with the most immature word you can think of. It can get dry, and the only real entertainment value this app can give is solely dependent on you, the player. 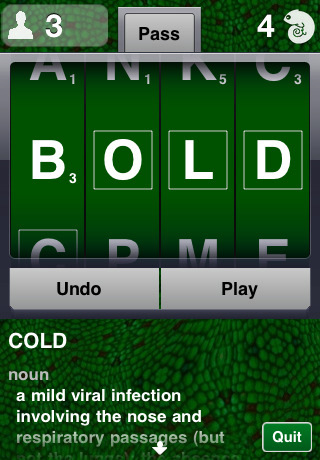 If you know you have fun by playing word games, then this is a modest app at best. Otherwise, you may not want to pay $1.99 on a game that you and your friends could play with a pen and paper. AppSafari review of Fourfeit was written by Joseph Ho on July 30th, 2010 and categorized under App Store, Games, Universal, Word Games. Page viewed 3366 times, 1 so far today. Need help on using these apps? Please read the Help Page.